When it comes to nutrition, few plants offer more value than the coconut. Tropical island communities have long relied on the coconut as a primary source of life-sustaining meat, juice, and oil. Dependence on the coconut is still common, and an estimated 30% of the world population still relies on this power food for some form cosmetic or holistic sustenance. From a dietary perspective, it is the nutritional content of coconuts that provides the antioxidants, healthy medium-chain fatty acids (MCFAs), and fiber that makes the food such a healthy addition to any meal. It is the coconut oil extract, however, that modern medicine is now linking with profound health benefits. These health benefits include those that are cosmetic in nature, like enhancing the appearance of skin and creating fuller and more resilient head hair. Recently, however, modern medicine has identified more functional benefits that show coconut oil may strengthen the immune system, prevent infection, and create a healthier overall self. Treating the skin with coconut oil does a whole lot more than simply moisturize. 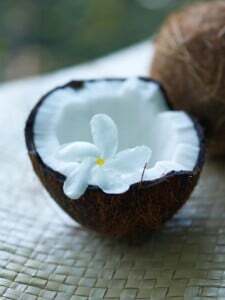 Coconut oil deeply penetrates the outer layer of the skin, traveling down to the dermis to supply underlying tissues with powerful nutrients. Included in those nutrients are antioxidants that help to rebuild collagen, elastin, and connective tissues that make the skin appear tight and firm on the surface. The high antioxidant content of coconut oil also helps to prevent the body’s natural oxidation process from damaging other cells. Without a surplus of antioxidants, like those provided by coconut oil, free radicals are left to roam the body and slowly damage the cellular membranes of other structures. Numerous studies have linked such damage with skin cancer, DNA damage, and even Alzheimer’s disease (when oxidative stress occurs in the brain). Organicfacts.net has named coconut oil “one of the best natural nutrients for hair” (i). Applying coconut oil to the hair is easy: Simply massage the oil directly into the hair and scalp. If the coconut oil is in a solid state (such as butter or paste), simple warm it until a liquid gel consistency is reached. Following application, the oil moisturizes the scalp much like any other area of skin and creates a healthy foundation from which hair may grow. As mentioned above, the oil quickly travels down through the outer layer of the skin and nurtures the cellular structures of the underlying dermis. Among those cellular structures are hair follicles responsible for hair production. Can Coconut Oil Prevent Gum Disease? One of the greatest health benefits of coconut oil is derived from its Lauric Acid content. Coconut oil consist of up to 40% Lauric Acid, a powerful antimicrobial compound that is converted to monolaurin after ingested. Monolaurin naturally strengthens the body’s immune system and aids in the defense against the bacteria that causes influenza, cytomegalovirus, and other diseases. Recent research also shows lower rates of periodontal disease (gum disease) and tooth decay among individuals who consume coconut oil on a daily basis (ii). Such research likewise cites the high Lauric Acid content of coconut oil as the main contributor to healthier gums, stronger teeth, and a longer lasting smile! Coconut oil extract is one of the healthiest and most powerful natural oils known to modern medicine. As documented above, coconut oil has the ability to nourish the hair, skin, and immune system with a powerful arrangement of antioxidants, antimicrobial agents, and Lauric Acid. Miami dentists and holistic health professionals recommend that patients incorporate all-natural health foods like coconut oil into their daily diets to continually replenish nutrient levels and antimicrobial agents like Lauric Acid. In doing so, individuals may greatly improve holistic health and longevity by bolstering their immunity to natural illness and disease.